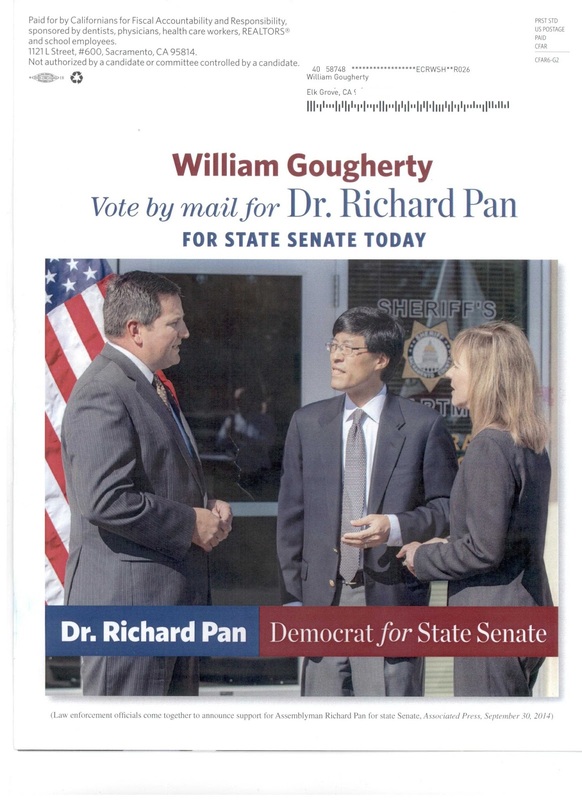 A recent mailing on behalf of California state senatorial candidate Dr. Rich Pan gets personal. The current independent expenditure mailer targeting registered Democrats not only is directly addressed, it has the person's name boldly printed on the top. One political consultant told us the per unit cost on this type of personalized mailer is about $1.40. From what we were able to ascertain, this mailer did not target non-Democratic voters. To date, no mailers from Pan's opponent, Assembly Member Dickinson, have arrived nor have any from independent expenditure committees. political mailer??? Give me a break. Meaningless. My name was programmed into some computer program - big deal. I get advertisements all the time which use that ploy. Sort of like Ose targetting 'seniors'. Cheap. I have received one Dickenson mailer, and I thought it was classy - no negative spin on it. What a waste of all the trees that were cut down to print up the campaign garbage. Good thing that most of us recycle.